Not just another pretty gage, the Series 7000 Spirahelic® Direct Drive Pressure Gages were originally developed in response to military needs for unbelievable resistance to shock and vibration while delivering premium accuracy. The Dwyer Spirahelic® features a triple coil spiral/helical wound Bourdon tube which provides the ultimate in operator safety while continuing to incorporate the advantages of a low inertia movement without gears or linkages. This low inertia movement is provided by the unique Bourdon tube design which eliminates complex mechanical movements such as gears that are common in conventional 'C' Bourdon tube gages which wear and cause inaccuracy or early failure. Expensive and leaky liquid filled gages are no longer necessary due to the triple wound Bourdon design which withstands shock and vibration. The direct drive of lightweight, precision balanced pointer reduces friction and mass, improving responsiveness and accuracy. So well, in fact, that on ASME Grade 2A or 3A models the accuracy is built in for life! Center post bearing carrier ensures precise bearing alignment for nearly friction free operation. Low volume Bourdon tube reduces fluid volume and stored energy, reducing potential for damage if tube ruptures from overpressure or other causes. A large area filter keeps dirt out and restricts flow from damaging the Bourdon tube. The smaller diameter tubing combined with a solid front case and rear blowout plug provides added safety. Convenience is enhanced by dual bottom and back process connections on panel mount models while Turret housing gages possess a dual 1/4" female NPT and 1/2" male NPT bottom connection. Impact resistant plastic case is sized to conform to ASME B40.1, replacing existing gages without changes in panel cutout or mounting holes. Compound ranges are available in either panel or turret style housings for applications where vacuum is present in the process. Wetted Materials: Inconel® X-750 alloy Bourdon tube, type 316L SS connection block. Housing: Black polycarbonate case and clear acrylic cover. Accuracy: 7112, 7212, 7312: Grade 2A (0.5% F.S. ); 7114A, 7214A, 7314A: Grade 3A (0.25% F.S.) with mirrored scale. Operation should be between 25% and 75% of full scale. Temperature Limits: -65 to 180°F (-53.9 to 82.2°C). 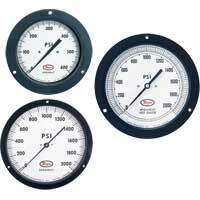 Sizes: 4-1/2" dial face (114.3 mm), 6" dial face (152.4 mm), 8-1/2" dial face (215.9 mm) - Design conforms to ASME B40.1. Process Connections: Two 1/4" female NPT field selectable back or bottom connection. Weight: 4-1/2" dial face: 16.3 oz (462.1 g); 6" dial face: 19.6 oz (555.6 g); 8-1/2" dial face: 27.3 oz (773.9 g). Standard Accessory: One 1/4" male NPT stainless steel plug. A-341 - Brass adapter, 1/4" male NPT to G 1/2 A (per ISO 228/1) parallel thread 2-1/2" length. A-341-1 - Brass adapter, 1/2" male NPT x 1/4" female NPT - 3-3/4" length. A-240-A - Cooling tower, perforated, 1/4" male/female NPT. A-250-A - Cooling tower, spiral, 1/4" male/female NPT. A-254 - Pressure snubber, brass, 1/4" male/female NPT. A-260 - Pressure snubber, 316 SS, 1/4" male/female NPT.